July 29, 2006 – Combat Zone Wrestling: Brain Damage participated in the 9th Annual Tournament of Death in Smyrna, Delaware..
~~~Brain Damage defeated Necro Butcher and Toby Klein (eliminated) in a Fans Bring The Weapons Death Match..
~~~Brain Damage & Nick Gage advanced over Brandon Prophet & Necro Butcher in a Barbed Wire & Panes of Glass Death match..
~~~FINALS: Nick Gage beat Brain Damage and Drake Younger and JC Bailey in a Light Tube Ropes & Fans Bring Weapons match..
April 21, 2006–IWA Mid South: Deranged & Brain Damage defeated The Iron Saints (Sal & Vito Thomaselli)..
April 22, 2006–IWA Mid South: Brain Damage defeated J.C. Bailey…. ~~~Brain Damage defeated Tank in a Barbed Wire Ropes/Fans Bring the Weapons Match in the 3rd Round of the Tournament..
~~~Mitch Page beat Toby Klein and Brain Damage and Dysfunction in a 4-WAY House of Pain Total Elimination Finals..
July 14, 2006–IWA Mid South: Deranged defeated Brain Damage in a No Ropes, Barbed Wire Match ..
July 15, 2006–IWA Mid South Wrestling: Brain Damage defeated Drake Younger…. October 2006: Brain Damage retired and vacated the IWA Mid South Tag Team titles…………. 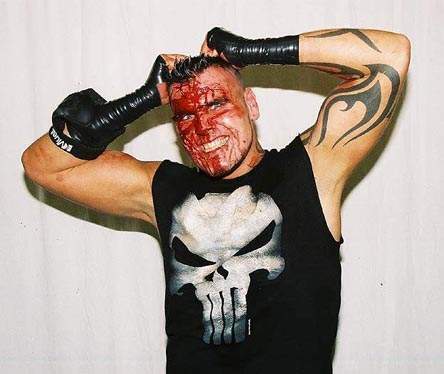 April 7, 2007–Combat Zone Wrestling: Brain Damage defeated Danny Havoc in Philadelphia, Pennsylvania…. ~~~SECOND: Brain Damage defeated Insane Lane and Necro Butcher in a “Fans Bring the Weapons Elimination” match..
~~~FINALS: Drake Younger defeated Brain Damage in a “Ultraviolent Divide & Conquer, 200 Lighttube Deathmatch Final”..
June 22, 2007–IWA King of the Death Match: Brain Damage defeated Insane Lane in a Fans Bring the Weapons Match..
June 23, 2007–IWA King of the Death Match: Brain Damage defeated Mickie Knuckles in a Fans Bring the Weapons Match..
~~~Freakshow defeated Brain Damage in a Lit Cigarettes/Hot Coals Match in the Semi Finals of the KOTDM Tournament…. July 14, 2007–Combat Zone Wrestling: Mitch Ryder & Brain Damage & D.J. Hyde beat Necro Butcher & Toby Klein & Danny Havoc..
August 11, 2007–Combat Zone Wrestling: Drake Younger vs. Brain Damage ended in a double pin draw in Philadelphia..
~~~Brain Damage defeated Scotty Vortekz and Danny Havok and J.C. Bailey to win the CZW Ultraviolent Underground title..
November 10, 2007–CZW: Brain Damage defeated Toby Klein to retain the CZW Ultraviolent Underground title..
December 8, 2007–Combat Zone Wrestling: Danny Havoc was the one and only Survivor in a spectacular Cage of Death match..
January 12, 2008–CZW: Brain Damage defeated Joker in a 20-Minute Iron Man Home Run Derby Death Match in Overtime..